New research shows that millions of working-age people across the UK are at financial risk due to their low levels of savings. The research, launched today by the Money Advice Service, shows that 4 in 10 (40%, 16.8 million) working-age people across the nation lack a savings buffer, with less than £100 in savings available to them at any time. These worryingly low levels of savings mean that huge numbers of people are vulnerable to unexpected bills or unplanned expenses that may have serious consequences on their financial stability. Unforeseen expenses are an unfortunate fact of life, with nearly three-quarters (71%) experiencing at least one a year. With so many lacking the savings to cover these expenses, large numbers of people are likely to turn to credit or borrowing from friends and family to cover these costs. For low income earners, saving presents a particular challenge. If household finances are already stretched to make ends meet then saving may simply not be an option, particularly for families with children and those paying down debt. However, low income earners can and do save. The research showed that 23% of working-age adults on a household income of less than £13,500 have more than £1,000 in savings and 40% save every/most months. We already know that levels of income, debt and life stage all affect consumers’ approach to saving. This new research highlights further factors that influence savings behaviour across the UK. These include a ‘live for today’ mindset where UK consumers feel they can’t or won’t prioritise saving because of the scale and variety of commitments and demands in their day-to-day life. The research also highlights the importance of saving regularly, even if the sums are modest. The critical message coming out of this research is the importance of saving regularly, even if the amounts are small. It’s vital that people have day-to-day money management skills to engage with their finances and find the opportunities and motivation to put a little cash aside to meet their financial goals. Saving regularly, even in small, manageable sums, can make a real difference to people’s financial security. Speaking about the research, Nick Hill, Money Expert at the Money Advice Service, said: “These figures show the millions put at risk by the saving gaps in the UK. Everyone’s situations and abilities are different, so it’s important to find an approach to saving that’s right for them and their household. For some on low incomes, saving is a real challenge as they may simply lack the income needed to save at all. “But for many, developing a savings habit is very achievable. Regular saving is key to building up that buffer against those life surprises. If you earn enough to set even a little aside each month that’s great - a direct debit into a savings account might be an easy way to do this, even if you start small and increase the amount with time. More information on the importance of saving and tips on how to develop a savings habit is available on the Money Advice Service website. Joe Cockerline or Joanna Brady at the Money Advice Service. Email pressoffice@moneyadviceservice.org.uk or call 020 7943 0593 during office hours or 07767 438 670 outside of office hours. The ‘Closing the Savings Gap’ report draws on information from numerous existing data sources to create a clear image of how people across the UK are saving. The full report covers the behaviour of savers and an overview of the different approaches people take to savings, segmented by demographic makeup. It also includes details on the success factors behind successful savings behaviour and appropriate encouragement that may be offered to people to motivate them to save. The full report is available here. 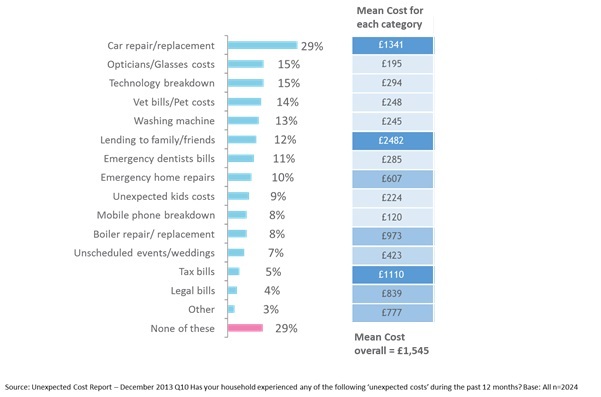 The below table details the percentages of people who said they’d been faced with a certain unexpected cost in a 12-month period, as well as the mean cost for each category (source: Unexpected costs report, December 2013. Jigsaw research). The below map shows the regional breakdown of individuals across the UK with less than £100 in savings. · Use the Savings Calculator to get an idea of how long it’ll take to reach your savings goal. More information on how to get into a savings habit can be found on the Money Advice Service website. The Money Advice Service is an independent organisation. It gives free, unbiased money advice online at moneyadviceservice.org.uk and free phone on 0800 138 7777. Debt advice is also provided through a variety of partners across the UK. The Service was set up by Government and is paid for by a statutory levy on the financial services industry, raised through the Financial Conduct Authority. Its statutory objectives are to enhance the understanding and knowledge of members of the public about financial matters (including the UK financial system); and to enhance the ability of members of the public to manage their own financial affairs.